So…who out there wants to win? Doesn’t winning sound better than losing. We generally think that in any race, if we are the winner, then someone else is the loser. But here’s the great part: God gives each and every one of us a race to run. He gives us a path to follow. A dream to pursue. A goal to accomplish. Our individual journeys, our race, on the way to the finish line looks different for each and every one of us. We all have different families, different upbringings, different education, different interests, different styles, different tastes, and different ways of doing things. Nevertheless, God says run in such a way to win your race. Your race, your journey is going to look different from mine, and yet God wants us both to win. So, in reality, we each have our own race in which we can win or lose and we can win without making anyone else a loser. In fact, the way God does things, if we run our race well, if we run to win, then we put ourselves in a position to encourage others. 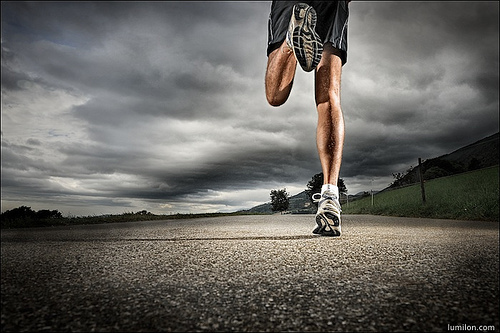 The best thing we can do in life is to run well, run far, run to win. God gives us grace to run, grace to continue, grace to win. He gives us a way to win, through His Son, Jesus Christ. What a gift, huh?! Jesus takes our sin, our failures, our shortcomings. And in return, we receive forgiveness, life and grace to run our race. Most importantly, through Jesus Christ, we are given the ultimate finish line: eternity with God, the creator of all things. Oh how those words encourage me as I run.